Founded in 2000, Aurelia® is the leading dental, medical and industrial safety glove brand in North America. A division of Supermax, Aurelia is one of the only brands that has its own manufacturing facilities. In 2006, they shipped over 20 billion gloves to over 150 countries. Founded in 1987, SUPERMAX is headquartered in Malaysia, strategically positioned near major rubber supplies, operating 12 state-of-the-art manufacturing plants. Supermax distributes worldwide, with dedicated facilities in North America (Aurelia), Europe, South America, Asia, Africa, and the South Pacific. Supermax Healthcare Canada Inc. was founded in August 2004. It is a joint venture between Supermax Berhad Corporation and Mr. Sylvain Bergeron. Supermax Healthcare Canada Inc. has a 150,000 sq. ft distribution center in Montreal, Qc. 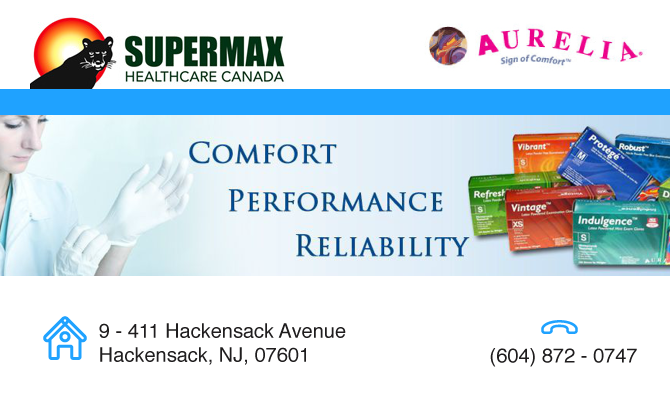 Our mission is to market in Canada, Supermax’s value-added medical examination gloves. We are focusing on the medical, dental, laboratory and industrial markets in Canada, selling mainly to hospitals and distributors. Supermax Healthcare Canada Inc. is dedicated in providing the healthcare industry with high quality infection control, single-use disposable products to our customers. Supermax Healthcare Canada Inc. covers Canada from coast to coast. Mr. Sylvain Bergeron is an executive manager that has 22 years of experience in the dental, medical and pharmaceutical industry. Mr. Bergeron graduated from University of Montreal in 1982 and brings relationships with all major dental and medical Canadian dealers. Supermax Healthcare Canada Inc. sales strategy is based on selling exclusively to distributor partners who in turn supply the professional end-user market. We are committed in providing our dealership with the support and high quality products needed to ensure market penetration and growing sales.